At 11AM on Friday, March 15, hundreds of thousands of students around the world walked out of their classrooms. From London to Tokyo to Kampala, young people took to the streets in a global strike from school, demanding climate action. Here in Providence, two hundred and fifty students rallied at the State House with banners, signs, speakers, energy and conviction. In seven short days, two Rhode Island activists, Joelye Lann and Amick Sollenberger, were able to mobilize hundreds of people from across the state to go on strike together. At 17 years old, these two activists are students themselves, and they were asking their high school and middle school peers to walk out of their classrooms with them. Hundreds of their fellow students answered the call. They gathered on the State House steps, hoisting up hand-painted signs that read “It’s OUR Future,” and “Step Up or Step Aside!,” and made their voices heard. When the young Swedish activist asked students to join her for a worldwide day of school strikes, it was an unprecedented call upon youth to take climate action. Within days of putting out her call, students took on the mantle of organizing in over 100 countries and 1,000 cities worldwide. The Youth Strike for Climate movement in the US, spearheaded by Isra Hirsi, 16, and Haven Coleman, 12, demands, "With our futures at stake, we call for radical legislative action to combat climate change and its countless detrimental effects on the American people." They called on their peers across the country to to join them on March 15, and launched a website to connect students to the closest protest to their school. In Rhode Island, two young women, Joelye Lann and Amick Sollenberger, both 17, took the lead. When Joelye went to the website to find the closest strike, she was surprised to learn that none had been planned in the entire state. When she reached out to national leadership to confirm this was the case, she was encouraged to plan one for Rhode Island herself. After reaching out to Sunrise RI, the local hub of a national group of climate activists led by young people, Joelye was connected to a second student interested in planning a strike in Rhode Island: Amick. Students of North Kingstown High School and Lincoln School, respectively, the two began planning the strike together with less than a week before the day of action. Though both of the young women are not new to activism—Joeyle helped plan the March for Our Lives student walkout last year, and Amick has long been involved in her school’s environmental action club—this protest was different. On this one day, Rhode Island youth joined their peers from around the entire world to demand climate justice—in one unified voice. The College Hill Independent sat down with the two Providence organizers, Joelye and Amick, to talk about their experience building youth power for a global and local movement, why they do this organizing work, and what comes next in this fight. The Indy: Why did you want to do this kind of work? Joelye: I think it’s important to do strikes and protests because as a student, as a 17-year-old, I can’t vote yet. It’s so disheartening, but I’ve definitely heard from my representatives, “you’re not voting for me, so why does it matter?” It matters because we’re going to be voting for you, and we care. We still have opinions and those opinions are backed up by science and facts. That means something. Amick: One of the first ways that I got involved was when my friends brought me to some of the No LNG protests,* and it got me thinking about how fossil fuel infrastructure is negatively impacting people’s lives and this is happening here in Rhode Island. This is happening now. But we’re at a point where we can change it. Rhode Island is a small state and we could be leading the way, but we’re not. The Indy: It’s really interesting to think about how youth movements are in this moment where there is so much power being built across the country, whether it’s against gun violence or [for] climate justice. How do the young people in your schools, in your communities think about this power, feel about the strike, and what Friday meant for them? Joelye: These are causes that unite us because we’re all facing them. We need to show that students care, because we do. There are so many obstacles to us getting involved, whether it’s school, or not being able to vote, or drive to things, or have resources. So when we do show up, it makes it that much more powerful. The Indy: Did you face resistance or obstacles in getting students involved? Joelye: There were definitely some teenage boys who tried to make it into a joke. But I think as people start thinking about their futures, they’re going to start caring about these issues. It might be disheartening at first, but because so many people do want to act, something is going to have to happen. Amick: I’ve had trouble getting boys involved in environmentalism. I don’t know, it has to be made masculine somehow for men to care about it. I’m not exactly sure how to confront that but it’s something to think about. Our speakers were mostly women, and when you looked into the crowd, it was all girls. The Indy: How do you think about building support with people who weren’t involved? Amick: I feel like there are more people who are apathetic than actively opposed, which is unfortunate, I guess, but all those people who are apathetic are just people who could be mobilized if they were given enough impetus to do that. I remember seeing one of those graphs with the passive supporters and active supporters, and the passive supporters is really large, and in my community that group is definitely the majority. I could tell that when doing outreach for the strike and talking to people about whether they would strike. 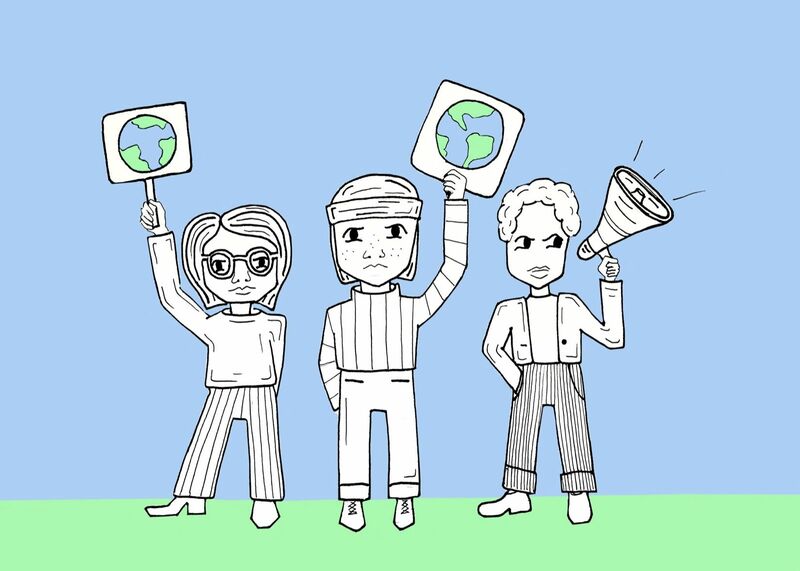 The Indy: Do you feel like there are relationships between the movements for climate justice and other movements for social justice in your schools? Amick: In general, climate justice has sort of started to be that thing that does bring together all the social justice groups we have. We’ve been having a lot of meetings in 2B1, which is our racial justice group, we’ve been having meetings about environmental justice and what that looks like in Providence and how it relates to our work. And in our feminist club, we’ve also talked about it—but I think this is all something that’s happened recently and we need to keep working towards. It’s all connected. The Indy: What comes next for you and your work in climate justice? Amick: Right now our group is planning a week where in our classes, we ask that we talk about climate justice through the lens of that specific class. I think it’s really important we talk about this as much as we can, in school and out of school. Realizing that it ties into literally everything we’re learning in school, it’s an eye opening thing. The Indy: Is there a particular moment from Friday that felt special to you? Amick: I was walking from the other side of the State House, and the moment that I walked around to the front and saw all the people there, that was a powerful moment. Joelye: I got there with a few people and got there on the early side. We were walking out of the parking lot and we saw another group walking in, another group ready to strike, and we just felt like, we’re ready to do this! I was like, we really reached people! That whole day, I just felt like, yes, this is a serious issue, but we did this. We pulled this off. MARA DOLAN ‘19.5 wants us to follow the lead of young women more often. She is a member of Sunrise RI. *No LNG in PVD is a campaign dedicated to resisting the construction of National Grid’s liquified natural gas facility in the Port of Providence, home to working class communities of color already burdened with the vast majority of Providence’s toxic waste and energy facilities.